This is a walk of Great British contrasts: everything is hustle, bustle and diversity, but you can also see green hills on the skyline and can smell the sea. 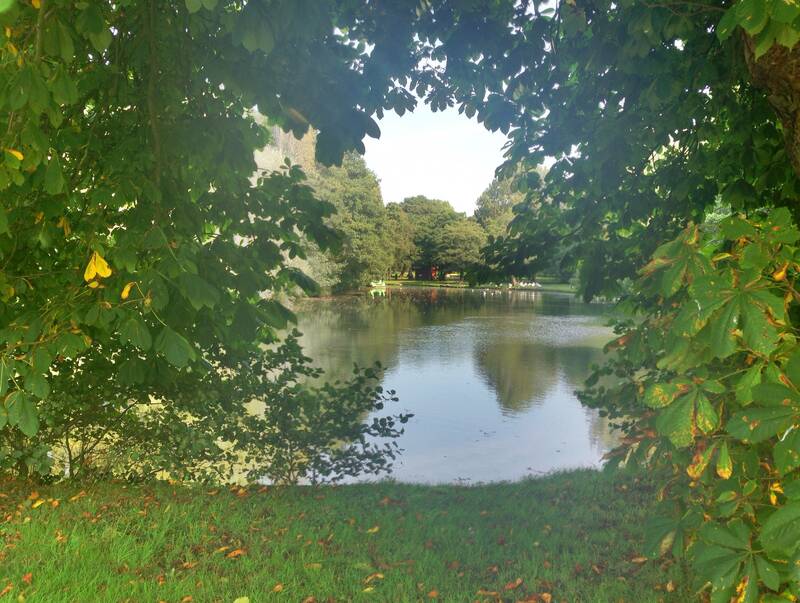 Parks, gardens, squares, cemeteries Clyne Gardens, Singleton Botanical Gardens, Victoria Park, Cwmdonkin Park, Parc Llewelyn and Brynmill Park have all been awarded the prestigious ‘Best of British’ Green Flag award. 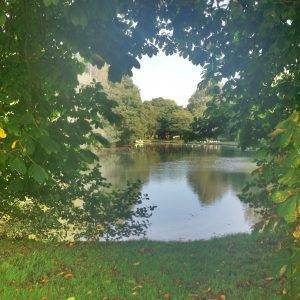 Rivers, canals, lakes Swansea Canal, Fendrod Lake, Singleton Boating Lake, River Tawe. Seafront The Mumbles and the Gower. Stunning cityscape Castle Square, Alexandra Road. Ancient Buildings & Structures (pre-1740) Swansea Castle (1107). Georgian (1714-1836) Mumbles Lighthouse (1794), Dylan Thomas Centre (originally the Guildhall (1825). Victorian & Edwardian (1837-1918) Swansea Central Library (1887), Swansea Old Police Station (1913) – both now owned by the university. Industrial Heritage The Hafod Morfa Copperworks — once the crucible of the global copper industry and vital to Swansea’s development. Open all year free of charge. Pathways and interpretation boards help you find your way around. Also the docks, including the Pilot House (late 19th C), Ice House (1880). Modern (post-1918) The Guildhall (1934), Marina Towers Observatory (1989). Great ‘Pit Stops’ Plenty of great cafe’s in Uplands and along Wind Street. 360 cafe on the seafront. 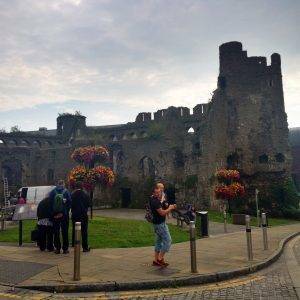 Quirky Shopping Swansea Market – the biggest indoor market in Wales, Mumbles for Welsh gifts and crafts in a beautiful setting – try Dragon Crafts, Gower Gallery and more. Also the Gower Kite Shop on the Gower Peninsula. Date of origin: The oldest known remains on the Gower Peninsula belong to the ‘Red Lady of Paviland’ and dates from 22,000 BC. ‘Type’ of city: Cathedral City. Some famous inhabitants: Dylan Thomas, Catherine Zeta-Jones, Sir Harry Secombe, Bonnie Tyler. Films/TV series shot here: Some of Doctor Who was filmed in the Old Library. 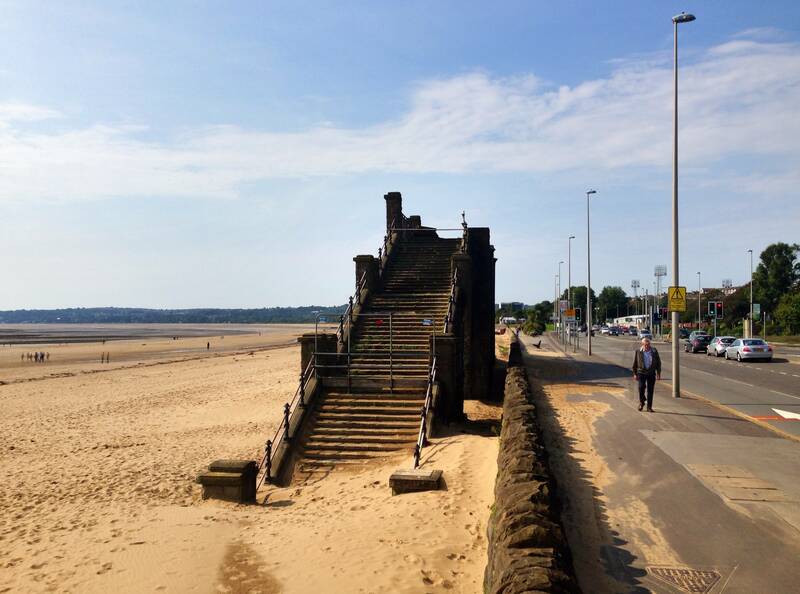 Swansea’s most famous son, Dylan Thomas, described Swansea as ‘an ugly, lovely town, crawling, sprawling, slummed, unplanned, jerry-villaed and smug-suburbed by the side of a long and splendidly curving shore’. The city is a total melting pot of everything British, both beautiful and ugly, from prehistory found on its surrounding hills to the modern café culture around its city-centre marina. It also accesses some of Britain’s most spectacular coast and hills: the Gower Peninsula and Brecon Beacons respectively. Western Europe’s oldest modern human remains were discovered by the sea here — the dyed ochre bones of the ‘Red Lady of Paviland’ are now 33,000 years old — but it’s thought that settled life in Swansea began with a Viking trading post. 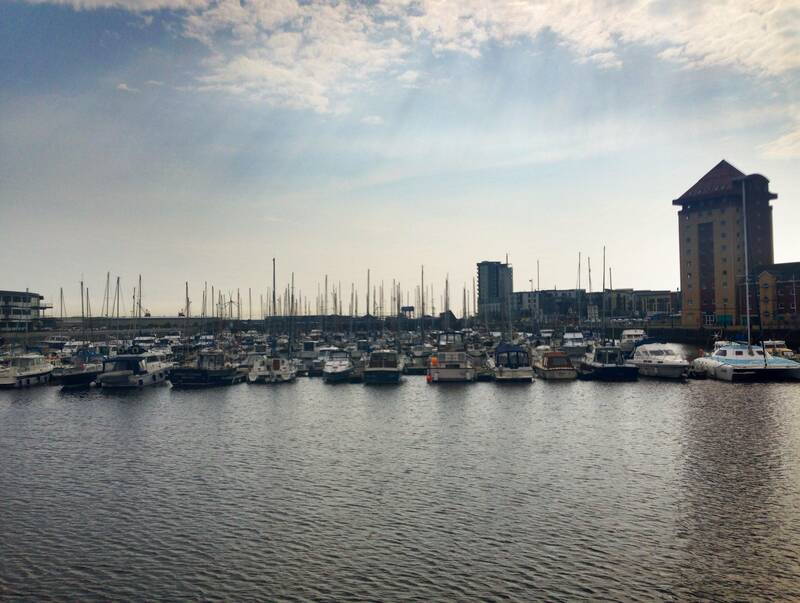 The ‘Swan’ part is a name — it’s probable that Danish king Sweyn Forkbeard founded Swansea — while the ‘ea’ part was very likely ‘eg’ or ‘ey’, which is Old Norse for ‘inlet’ or ‘island’: long ago there was a small islet in the mouth of the River Tawe. 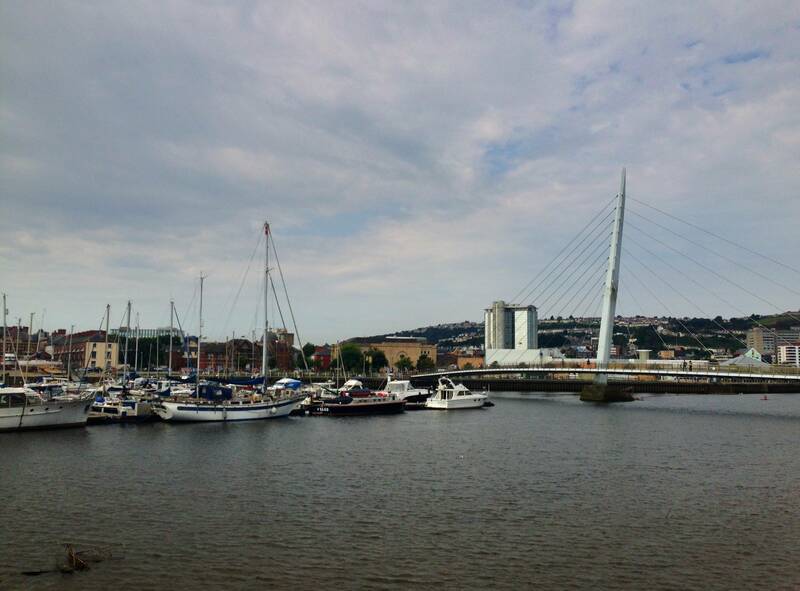 The Welsh name for the city, Abertawe, meanwhile, means Mouth of the Tawe river. In the early 12th Century the conquering Normans took charge, and the resident Norman lord built a wooden castle. 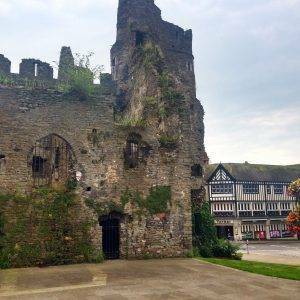 A town of mostly English immigrants grew up around it, and the castle (the ruins of which still grace the city centre) was rebuilt in stone in the early 13th Century. Proximity to the sea combined with fertile farmland meant that by this time the city was flourishing off the back of leather and wool exports, and had a population of 1,000. 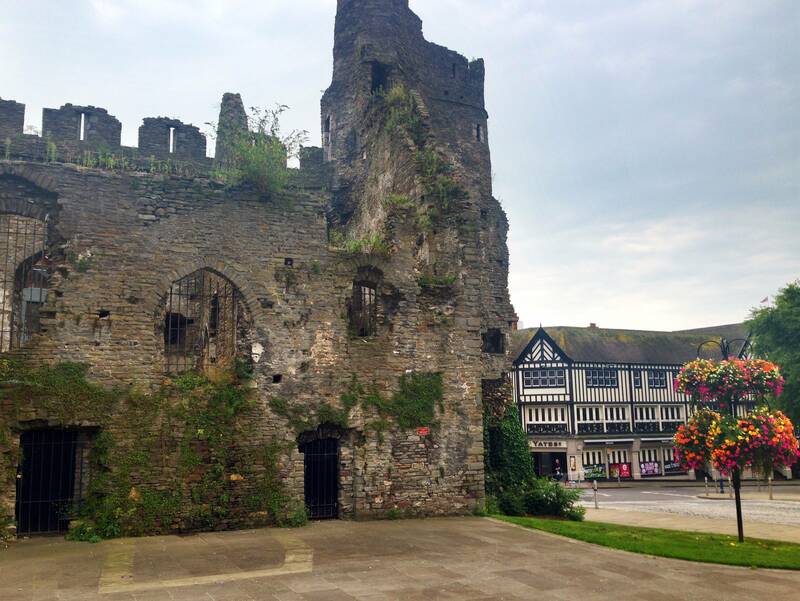 Stone walls were built around the town in the 14th Century, although this didn’t prevent the Welsh attacking it several times. By the 17th Century, coal mining in South Wales was booming and the population had swelled to about 2,000, with a busy port. Inn 1655 Cromwell said Swansea was ‘an ancient port town and populous, situated on the coast towards France, convenient for shipping and resisting foreign invasions.’ Prosperity led to culture and, during the 18th century, it became a busy market town with its first bank, theatre and grammar school. 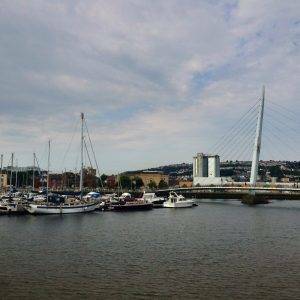 By the 19th Century, Swansea was booming as a centre of the metalworking industry, exporting vast amounts of zinc and copper and tin along the canal and out through the port. In 1801 the population was 6,831, by 1841 it was 16,000 and at the end of the century, it had passed 100,000. Things gradually improved: in 1809 Paving Commissioners became responsible for paving, cleaning and lighting the streets. In 1821 smart Assembly Rooms were built for balls and playing cards, and during the latter half of the century a general hospital, public library and Victoria Park were opened. King’s Dock and Queen’s Dock were built in the early 20th century. The Glynn Vivian Art Gallery opened in 1911, the Guildhall opened in 1934 and then things took a severe bashing as the heart of the city was destroyed in the Second World War. As a channel port, it was an obvious target — the docks and industry were vital to the war effort. Swansea was attacked 44 times during the war, and for three consecutive days in 1941, when the resulting enormous fires acted as a homing beacon for more and more waves of German bombers. The death toll reached 230 and 400 injured. Following the war, traditional metal-working industries plummeted along with Swansea’s economy, and coal mining in the area declined, too, until the docks became an industrial wasteland. This, combined with the fact that the city centre was destroyed and took 30 years to rebuild, led to Swansea going through a bit of a dark age and regressing to Dylan Thomas’ description at the start of this story. Swansea has thankfully now revived: the city centre has been rebuilt, and still boasts some beautiful architecture from a Norman Castle to many Edwardian and Victorian buildings, while the docks have been converted into a beautiful marina with public walkways and thriving cafés, which leads onto a stunning promenade along Swansea’s white sandy beach seafront. Stepping out of the station at Swansea, it’s already a walk of Great British contrasts: everything is hustle, bustle and diversity, but I can also see green hills on the skyline and I can smell the sea. In 1850 when the station was built, industry was really taking off here: a lot of Swansea’s grandest Victorian buildings including the library, which we’ll see later, were built at this time. Its domed reading room featured in Doctor Who. Once, a connecting line ran from the station down to coal tips on the docks, which I’m looking forward to exploring later in the walk, too. As an aside, back in 1895 Swansea had six other stations, owned by five competing railway companies. One of these was the Swansea and Mumbles Railway, which was the world’s longest-serving railway when it closed in 1960. It was built in 1804 to transport coal, iron ore and limestone in horse-drawn vehicles, and carried the world’s first ever fare-paying passengers in 1807. It progressed to steam locomotion in the 1870s, and later electric trams. There’s talk of re-opening the line every now and then. Turning left and walking down the High Street I can already see a mix of architectural styles nestling inside each other like Russian dolls, and remember Dylan Thomas’ description of ‘an ugly, lovely town, crawling, sprawling, slummed, unplanned, jerry-villaed and smug-suburbed by the side of a long and splendidly curving shore’. A five-storey, Victorian Gothic red brick pile with huge bay windows and an eerie balcony has a modern hair salon tucked under it. The words WH Smith and Son’ and ‘Labour Hall’ are fading out of sight on the brickwork. 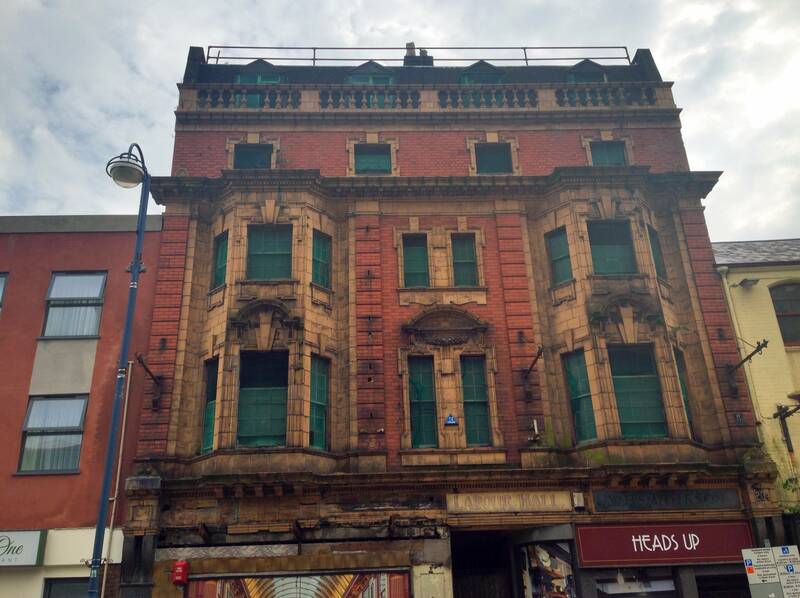 Next to this, two simple pastel painted buildings, more Welsh cottage style, house the OMG Bar and Club and the Middle Eastern Bread Shop. Further along, another Gothic heap, white stone this time, with a Rapunzel turret jutting from a roof overgrown with greenery. I pause when I reach Church Street and the incongruous remains of a Norman castle pop into view. Unfortunately, they didn’t care much about sympathetic renovation in the Middle Ages: the oldest building in Swansea was pretty much left to ruin when the Lords of the Gower left, and bits of it were variously used as a bottle factory, debtors jail, and workhouse over the following centuries, or just knocked down. 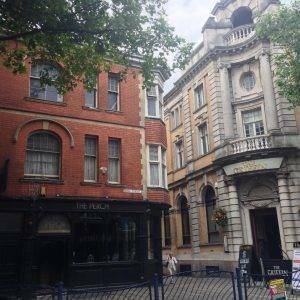 In the early 1930s, the South Wales Daily Post offices and printing presses filled the courtyard, and Dylan Thomas worked here as a young reporter. 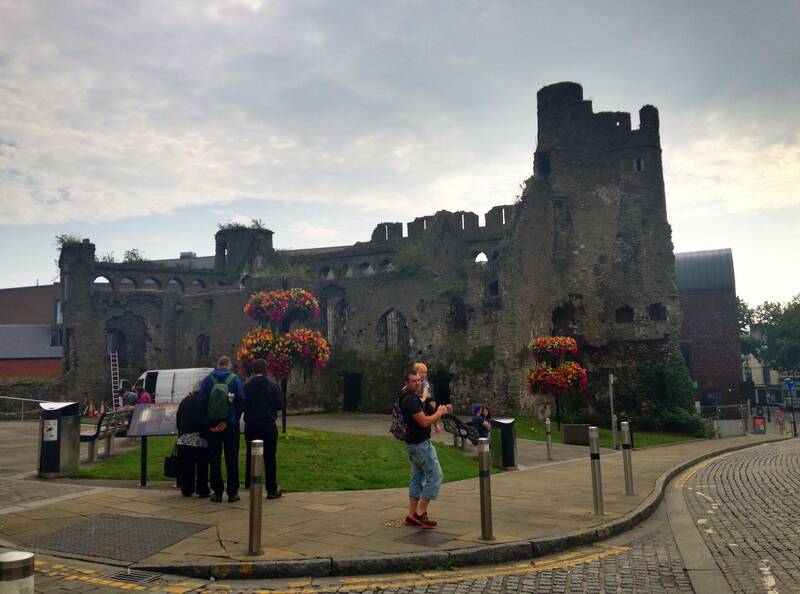 Testament to sturdy ancient construction methods, the castle has survived a lot worse than these transgressions: the Welsh regularly enjoyed attacking it when it was occupied by the Normans, and it shook off the three days of onslaught during the Blitz. I continue down Wind Street, a beautiful area which thankfully also survived the German onslaught. 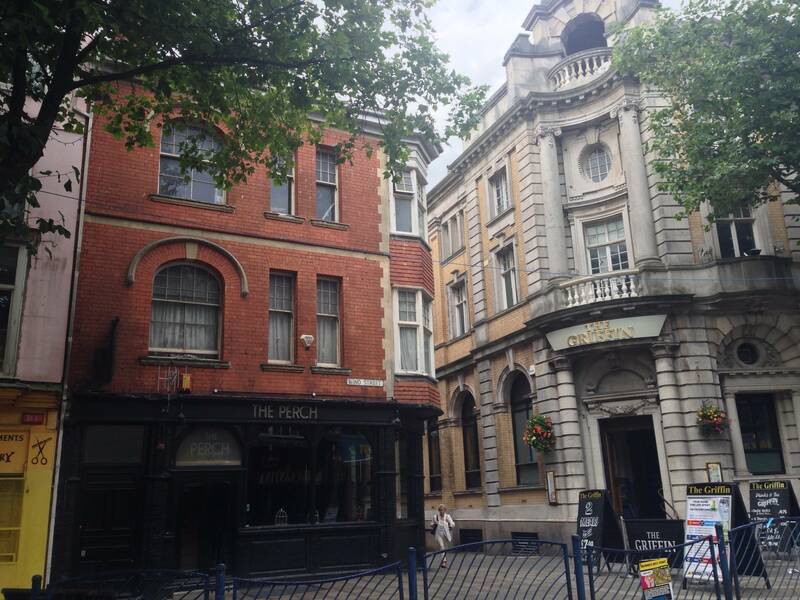 Better known as Wine Street, it’s the going-out area of Swansea: a leafy street with tables and chairs set out, grand buildings and lots of opportunities to refresh with a coffee or aperitif. The Bank Statement Bar, an impressive former Lloyds Bank showpiece, is now a Wetherspoons. The No Sign Bar next door was a haunt of Dylan Thomas. It dates from the 17th or 18th Century, and the wine cellars are said to be even older. It was not required to display a sign like ordinary public houses when it was licensed just as a wine bar, so earned this nickname. Further along, Salubrious Passage would not be out of place in a Dickens novel. At the end of the road, I glimpse a florid Baroque pile in red and white stone, resembling a heavily-iced cake. Inside, a grand mural adorns the boardroom, featuring tall masted ships on River Tawe and Swansea Castle. The building is now a fancy hotel, restaurant and bar called Morgans, but it used to be the Harbour Trust Offices for the docks, which lie beyond. It was a piece de resistance in 1902, sadly not long before industry collapsed here. 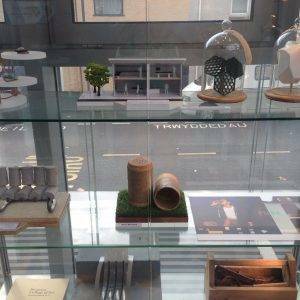 100 architects submitted designs from all over Britain with 100 guineas (£6,000 today) as a prize. Cardiff architect Edwin Seward won, and went on to build some of Cardiff’s most notable buildings thereafter. 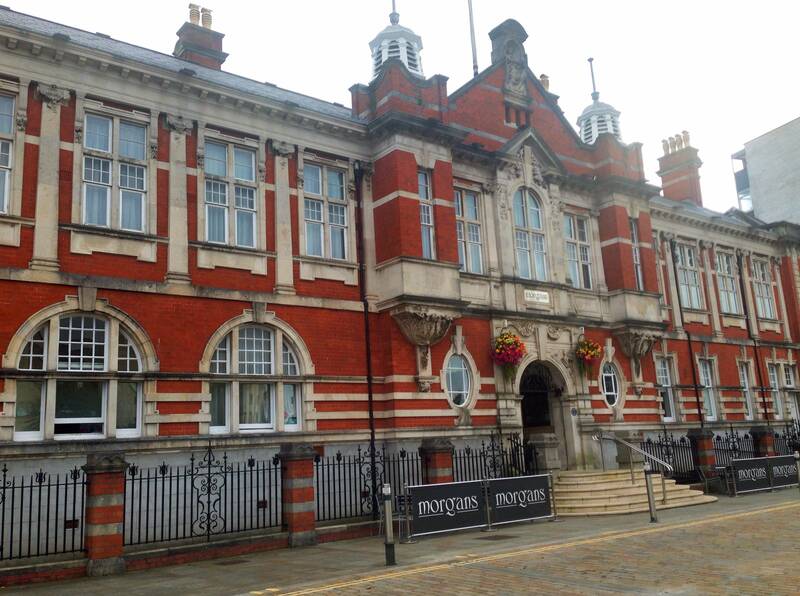 I continue past Morgans to reach the Dylan Thomas Centre, formerly Swansea’s Guildhall, built in 1825. The sandstone facade — featuring Corinthian columns, arched windows and gargoyles — houses a permanent exhibition on the life and work of Dylan Thomas, a bookshop and a café. 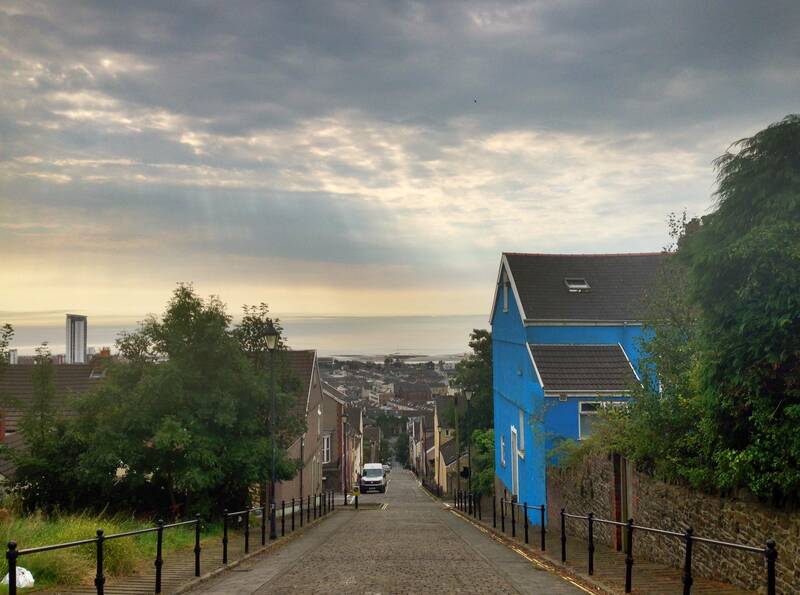 Just beyond the building, by contrast, lies Swansea’s Maritime Quarter, which has been significantly regenerated. 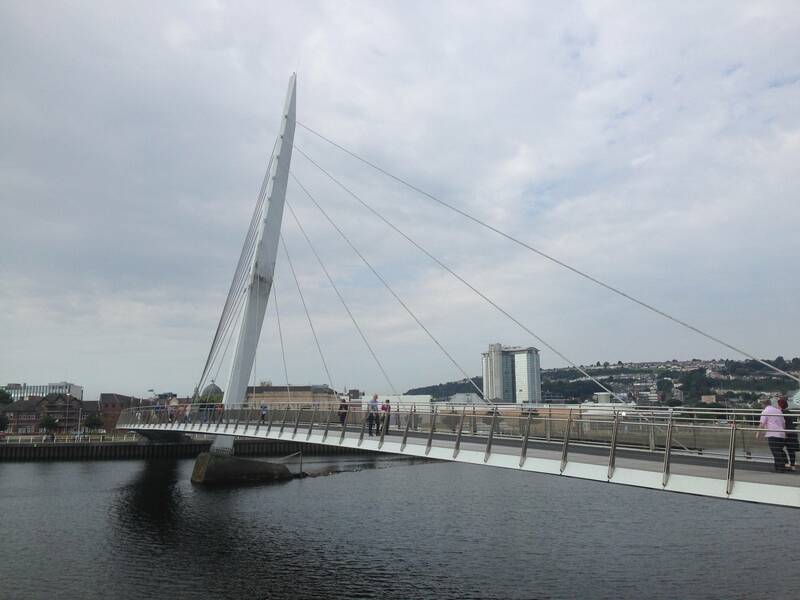 A striking, harp-like pedestrian bridge links the new waterfront development. I head across, admiring the boats bobbing. On the other side lies the Ice House with its big chimney. It was built in 1880 as an ice factory for Swansea’s growing dock trade, and later became a ship’s chandlery, before being converted into flats and cafés. Nosing around this area, it’s hard to believe that it was an industrial wasteland not so long ago. After years of decline, the docks closed in 1969. 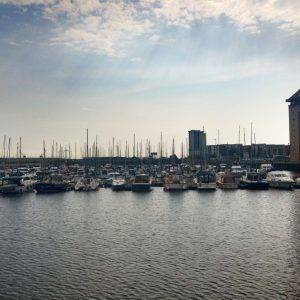 It looked so bad that the original plan was simply to divert traffic and people away from the area, but later a new plan was thought up: clearance and land acquisition began for a leisure marina. Now it’s so lovely there are benches and public walkways provided for strolling and admiring purposes. 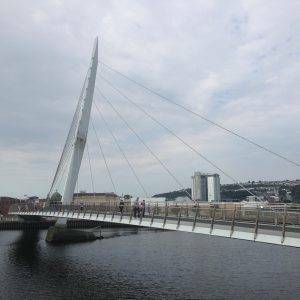 I turn right and follow the walkway to reach the Swansea Barrage. When it was completed in 1992, it was the first barrage across an estuary designed for leisure use, testament to some clever thinking. 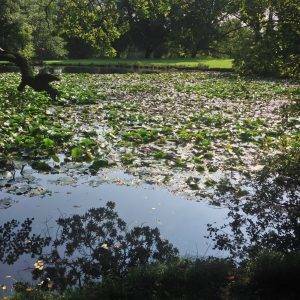 It permanently raised the water level — previously mudflats had been exposed along the banks by each falling tide — creating a lake area for boats, with a lock to allow boats out to the sea. They even considered the fish: it features a fish pass for salmon and sea trout to return from the sea to their native rivers to spawn. On the other side of the bridge, I spot the 19th Century Pilot’s House, built to help guide ships into port — the tower was a look-out. Here I turn left to reach the beach, and alternatively stroll along the promenade and dive off onto the golden empty sand. 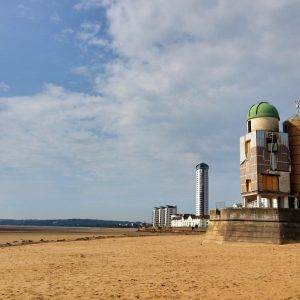 It’s hard to miss Swansea’s observatory, with its statue of a figure on the roof, especially as its currently being noisily renovated into a glass-fronted café, but also because it resembles a spaceship on its launch pad. The observatory comprises two towers. 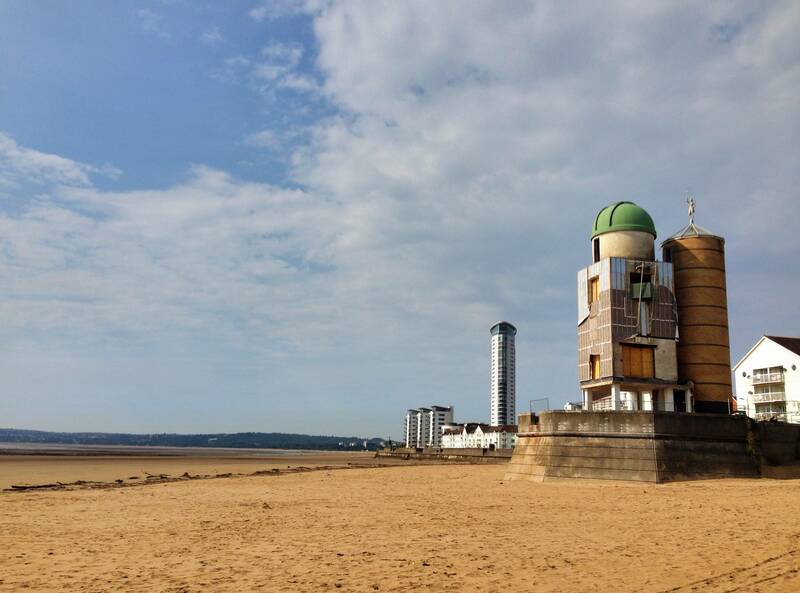 The white one with a domed roof used to contain the observatory and the largest optical astronomical telescope in Wales used to be on its roof. This dome was placed in a trough of salt water and oil, so it could be rotated effortlessly with one finger. The other tower has a spiral staircase inside with access to the observatory. Its purpose was to prevent vibrations from the stairs affecting the observatory tower. This secondary tower has a model of the solar system suspended from the centre. Each step on the stairwell represents a distance of 46 million miles on the journey from the sun’s disk at the ground level to Pluto at the entrance to the observatory dome. The top of the tower, meanwhile, features a stained glass design by internationally-renowned artist David Pearl. Further along, I reach the Slip bridge that doesn’t connect — there are stairs to nowhere on either side of the road alongside the beach here. It was built in 1915 and dismantled in 2005 for maintenance reasons but has still not been reinstalled, despite the best efforts of the Friends of Swansea Slip Bridge website. 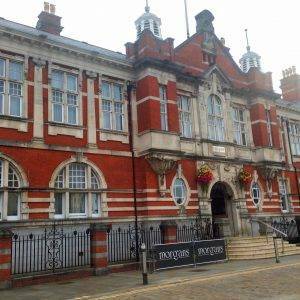 From here you can detour to the Guildhall, Brangwyn Hall. Inside it are amazing paintings known as the Empire Panels, which were commissioned in 1924 for the House of Commons but rejected as too ‘colourful’ and ‘spirited’. Designed to commemorate the First World War, they show breasts, rippling muscles, and turbaned heads topped with riots of flowers and fruits. At the end of the beach walkway, I continue along a leafy avenue alongside the main road, with outdoor fitness machines alongside it and a bicycle lane. 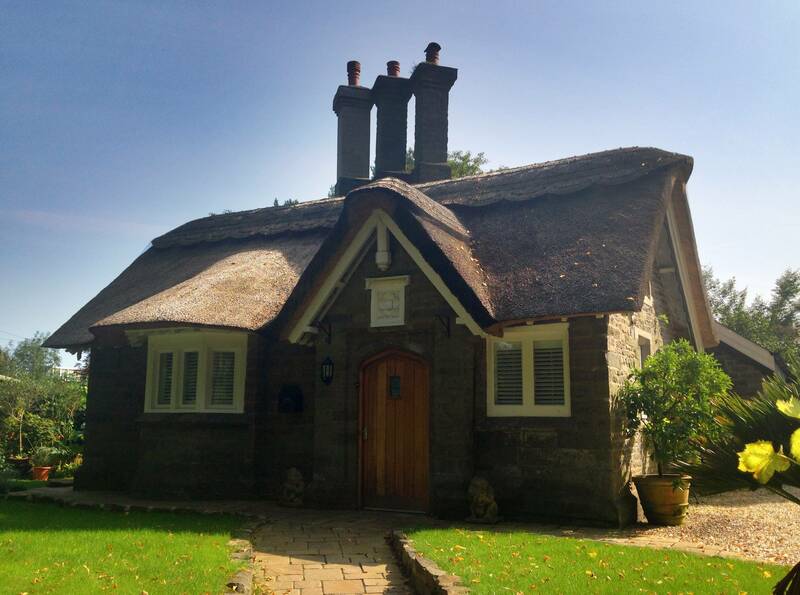 Then I cross to Singleton Park and stroll past a thatched cottage, lacrosse field, ornamental garden, lily ponds and a squirrel rotating an acorn. It’s all very British. 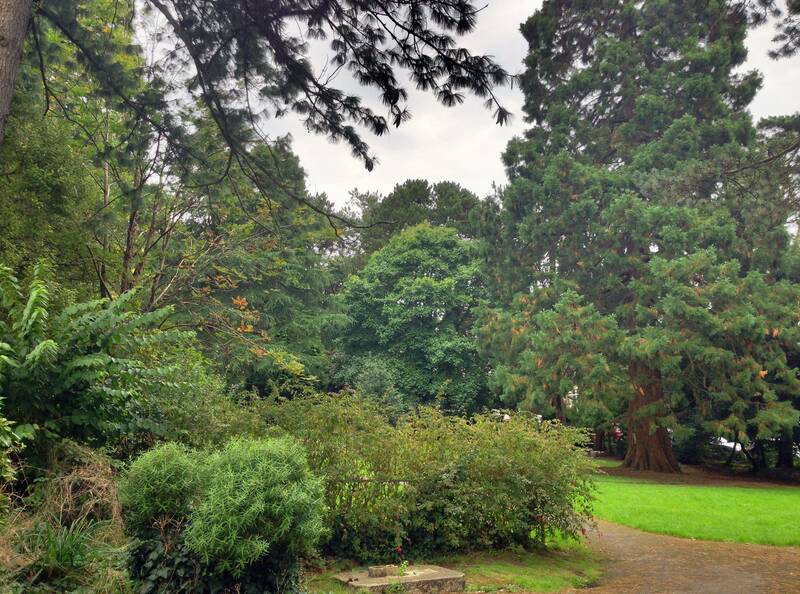 I continue through Brynhill Park, then wander up the road to the Uplands area of Swansea, where it’s time for lunch as there’re lots of nice cafés here. 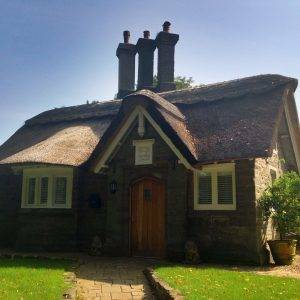 You can also detour to the house where Dylan Thomas was born. After lunch, another park: Huge trees enclose St James’ Park, and all I can hear is birds singing. After following the winding path through, I turn right along Ffynone Road, where there are some lovely Victorian houses, including the Buddhist Centre, an impressive building with sash windows and turrets, and a sign saying ‘everyone is welcome.’ It was built in 1863, as the family home of an iron merchant. At the time it was surrounded by woodland. At the end of the road, a sea view appears on the right. I carry on past pretty pastel terrace of houses to reach the cobbles of Constitution Hill, which reaches a gradient of 33% in places. There was a tramway on this road between 1898 and 1902: a winding house stood at the top. Unfortunately, it was not a success so I walk up it, turning every now and then as the sea view becomes more expansive as a reward. 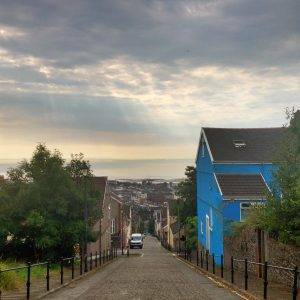 At the top, I turn right onto Terrace Road and watch pre-school children, brightly dressed infants against the impressive Victorian or Edwardian building with a sea view beyond. I carry on steeply down to reach Alexandra Road and to finish on a high. Turning left I pass the police station, where there’s a modern sculpture. 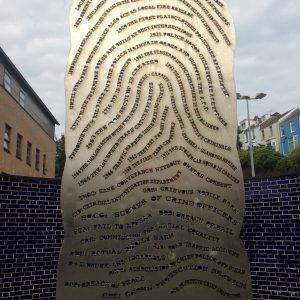 A metal fingertip rises from the tarmac, with strings of words forming the whorls of a fingerprint, which chart episodes in the police history of Wales. Further along, the road stands the old Swansea Central Library, a Grade II listed building, and another florid Baroque pile, which opened in 1887. The circular reference library has a huge domed reading room, which is 7.6m tall. It was used as a location for the Doctor Who episodes ‘Silence in the Library’ and ‘Forest of the Dead’. Swansea Met University bought the building and with funding from the EU gave it a £9.69 million renovation, almost £5 million over the budget, in 2015. A fitting end to the walk. At the end of the road, I reach the station. Turn left out of the station and head up High St to Castle St.
Continue down Wind St, the ‘going out’ area of Swansea, also known as Wine St, where there is a range of café options. At the end of the road, cross towards the grand Morgan’s Hotel. 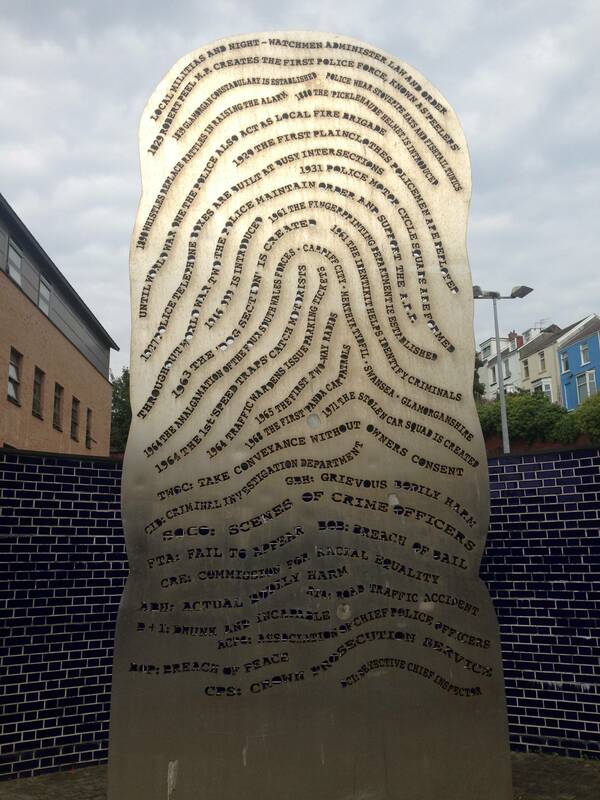 Continue to the left of it, past the Dylan Thomas Centre, to reach the funky new bridge. Cross the bridge and turn right along the marina to reach the old bridge, weir and lock. Cross the bridge, then bear left to reach the sea front promenade. Here you can continue along the walkway, dip out onto the white sand beach, or a bit of both. Cross the main road at the traffic lights and proceed up Sketty Lane. Just past the hospital, turn right to enter Singleton Park. Keep right, following signs for the Lacrosse Lawn and Ornamental Gardens. 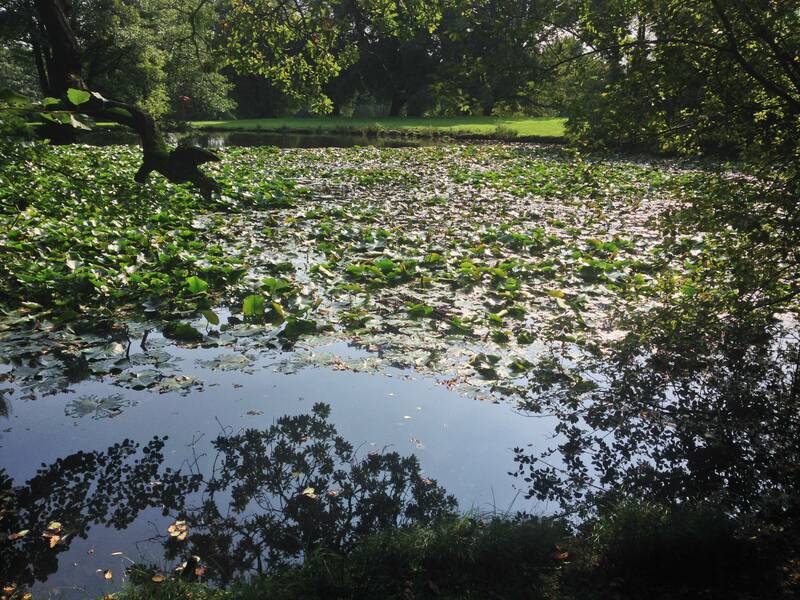 Keep going to a T-junction, then turn left, past the Lily Ponds and a red wooden building straight out of a fairytale. Emerge from the park opposite the Brynhill Coffee House. Cross the road and enter Brynhill Park. Keep right, exit the park at the far end on the right, turn left to a T-junction, then turn right onto Glynbrydan Road. Keep going until you emerge in Uplands, where there is a range of cafés for a lunch break, including the Uplands Tavern, where Dylan Thomas used to stay. Continue down Walter Road, and turn left onto St James Crescent. Enter St James Park and exit at the far end on the left. Turn right onto Ffynone Road: at the end of it, a sea view appears. Continue on Brooklands Terrace to reach the cobbles of Constitution Hill. Turn left and walk up it to the top, then turn right onto Terrace Road. Turn right at the end of the road and follow it downhill past the Metropolitan University to reach busy Alexandra Road. Turn left along the road, past red brick Victorian university buildings to reach the train station again. One of the best cafés on Wind Street. Stop at this beachside cafe for lunch or coffee halfway along the beachfront section. Great little sushi bar in Uplands. Alternatively try the great tapas here. Swansea Market is the largest indoor market in Wales. 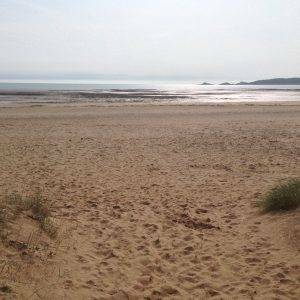 Fresh Welsh cakes, a wonderful cheese counter, several butchers and fishmongers among a wide range of other permanent stalls, cafes and shops. 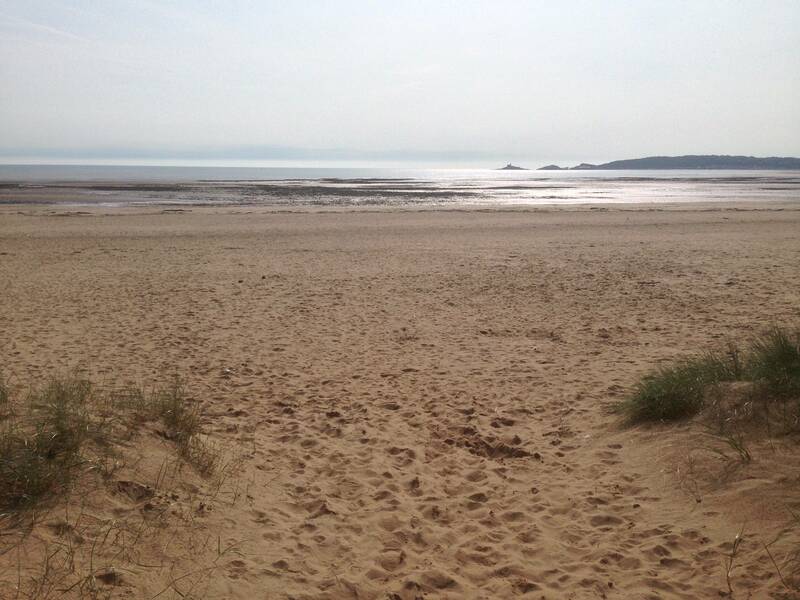 Head down the Mumbles for a beautiful beach and the best ice cream courtesy of Joe’s Ice Cream. Try the North Pole. 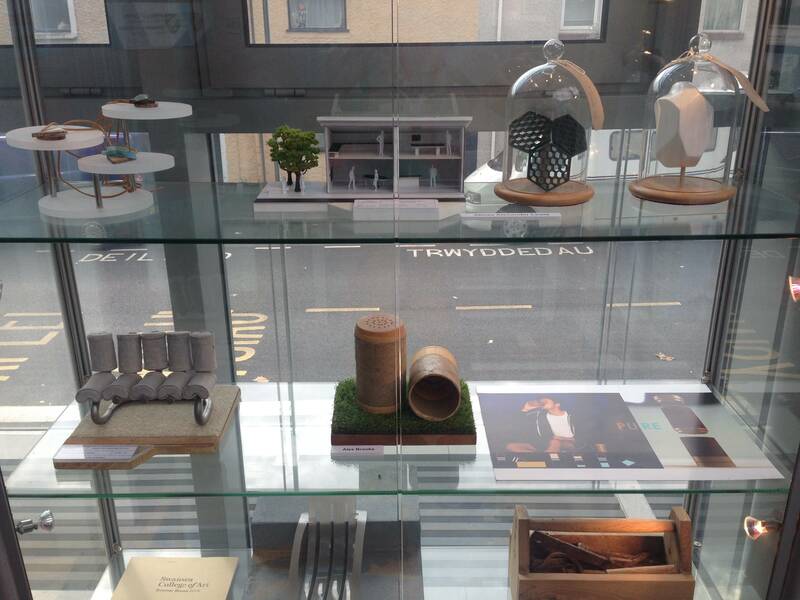 Pop into the Oystermouth Gallery for homeware or pick up a traditional, hand-carved lovespoon from the Lovespoon Gallery. Why not pick up a kite from The Kite Shop on the Gower. 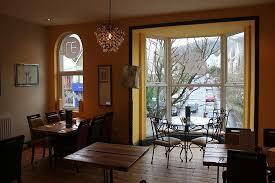 Pop in and check out the frescoes. 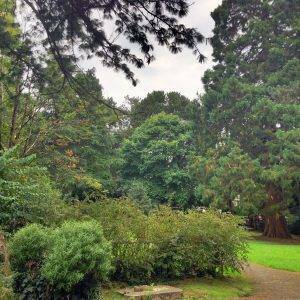 What a wonderful site this is and what and excellent descriptive walk through Swansea. I am so glad to have been directed here from the Memories of Swansea page on Facebook. Thank you so much for your contribution. I plan to do this walk on my next visit to Swansea. I left for Canada in 1970 but visit often. I also plan to make use of this site when visited other cities around the world. Thank you again!